Steve does three assemblies a day (additional presentations possible). He's happy to sign books during the day or during lunch. Please have children write their names (first name only) on a Post-it note and stick on the title page of the book. Steve can present from Kindergarten to 8th grade. Steve can work with any size group of students. In all of his programs, Steve encourages children to bring their questions on 3 x 5 index cards for a question and answer session after each program. Programs for kindergarten are about 1/2 hour in length. Programs for 1st graders and up are 45 minutes or longer. Steve will provide his own digital projector and computer. 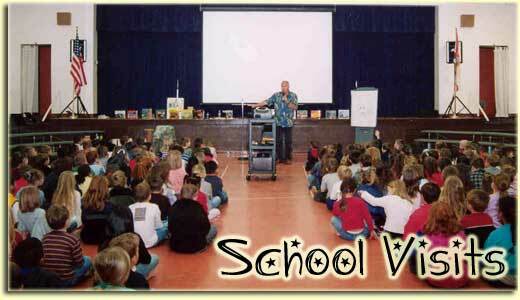 Schools should provide the following for Steve's programs: a large screen, a large table set up beside the screen, a small table, cart or desk for the projector, an extension chord, a wireless hand-held microphone with stand, bottled water, and a room that can be darkened for an effective slide presentation. Steve takes children on a tour of some of his children's books from the original idea and the blank page through stages of writing, editing, rewriting, illustrating to printed book. He highlights the use of strong verbs and interesting details, the importance of a good lead/introduction and the power of revision. Steve engages the class in a discussion about writing, editing, rewriting, journal keeping, photography, children's books and the publishing process. His show and tell includes his first manuscripts, rough sketches by the illustrator, color proofs and copies of the printed books. He includes his personal history and anecdotes about how he came to "the writing life." Children love to learn about the publishing process and where authors get ideas. Steve explores the fascinating world of the gray wolf and coyote. Based on his books, Once a Wolf and Coyote - North America's Dog, Steve traces with a slide show the history of wolf and coyote hatred. He shows the role scientists have played in preserving the wolf in such places as Yellowstone National Park. Learn how scientists track wolves in the wild and how they are trying to reintroduce wolves into the Southwest and other places. Steve shows wolf and coyote skulls and a cast of a wolf track. The program ends in a group howl! Steve takes kids, librarians, teachers and educators into the Spanish moss-draped backwaters and natural springs of Florida where the manatee swims. Through a slide presentation and numerous anecdotes, we’ll explore the manatee’s fascinating biology, we’ll meet the biologists that rescue and rehabilitate wounded manatees, and we’ll snorkel side-by-side with a manatee learning about its amazing adaptations. With a population of about 3,000 animals remaining in the wild, the manatee is one of the most endangered marine mammals in the United States. What are the threats to the manatee and what are biologists doing to save Florida’s gentle giant? As the author of Saving Manatees, Steve shares his passion for the natural world and the remarkable manatees. Based on his book, In Good Hands, Steve documents through slides the rescue, rehabilitation and release of a barred owl. Students learn about hawks, owls, eagles and other fascinating raptors and begin to understand the concept of the predator-prey relationship. Steve shows owl pellets, raptor talons and beaks and leads the class in an owl hooting demonstration. To arrange an author visit and program fees please contact Steve.